Why is Pagani Called Pagani? Pagani Automobile S.p.A was founded by Horacio Pagani in 1992, after the Argentinian left Lamborghini to pursue what he knew to be the next big thing in the automotive industry: carbon fiber. As a young man, Pagani had already been exposed to the wonders of the fuel-injected world. Alongside his friend Gustavo Marani, Pagani pursued his passion for speed and power by investing in a Sachs Televel engine he had received. Though the pair had originally wanted to fabricate a go-kart together, they soon realized 2 separate mini bikes would be a better alternative. Why race in the same 4-wheeled vehicle when you could split it down the middle and have 2 wheels each? In truth, Pagani received much of his formal training from Lamborghini, but when he approached them with the idea of moving towards carbon fiber, he was quickly shot down. If Ferrari wasn’t doing it, why would Lamborghini even attempt it? Thus, Pagani was born. The company calls the town of San Cesario sul Panaro home, which lies within a short distance from Modena, Italy. Why is it called Pagani? 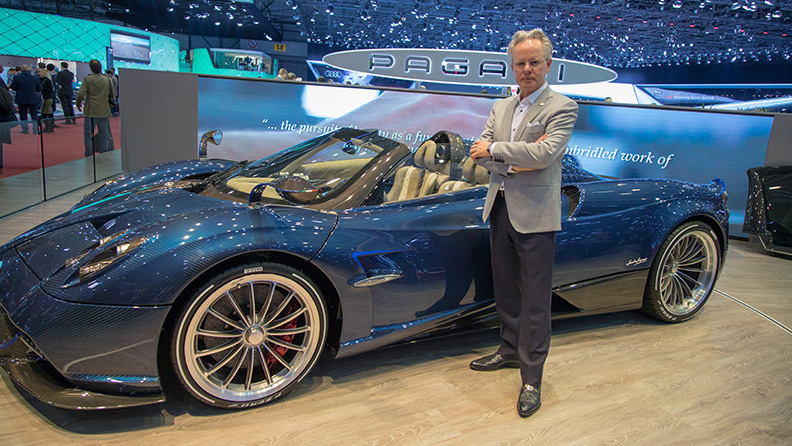 As you’ve probably already concluded, Pagani was named for its founder, Horacio Pagani. Much in the way of Lamborghini and Ferrari, Pagani used his last name as a branding mechanism. Though Ferrari and Lamborghini might be 2 of the most iconic super car brands named after real men, Pagani joins Koenigsegg and Fisker in comprising the progeny of the original super car era. And really, if you’re going to grab hold of carbon fiber as a cutting-edge concept, why not burn your name into the minds of the public, including even—or most notably—those who dismissed your visions as nonsense? Interestingly enough, Horacio Pagani purchased his own autoclave to produce his carbon fiber components, and is one of the foremost suppliers to names like Formula One, Daimler, Aprilia, and—you guessed it—Ferrari itself. Comprised of a simplistic color scheme and bold lettering, the Pagani logo pays tribute to the town which it calls home. The words “Automobili Modena” appear below Pagani’s name, and a stylized capital “P” stands opposite a blue crescent near the left-hand side. Though Ford’s logo presents a similar oval shape with silver and blue lettering, there is a stark difference in the two logos. Ford’s branding feels a bit more mainstream and simple, whereas Pagani’s logo has an air of structure and durability to it. Perhaps this is Pagani’s engineering spirit poking through. As the first model to be manufactured by Pagani, the Zonda C12 was unveiled as a new model at the 1999 Geneva Motor Show. The bold, swooping curves and sleek design instantly set the model—and brand—apart from other competitors. Of the Zonda models equipped with a 6-liter engine, there existed only 5 in total. However, owning a Pagani Zonda didn’t mean you could, in fact, drive it. Legally, that is. Every single Pagani Zonda that was manufactured from 1999 to 2011 is not street legal in the United States and cost ~$1.4 million. Owners are occasionally allowed to drive their prized possessions under a “Show and Display” title. Who wants to have to drive to a car show every time you want to get behind the wheel? All the same, a single bolt on the Zonda is priced at $80. Multiply that dollar amount by the 1400 bolts used in assembling the Pagani Zonda and you’ve got a pile of bolts that cost more than a typical Porsche 911. Pagani is true living proof that if you’ve got a dream and a passion for achieving more, don’t let others tell you what you can and can’t do. What innovative ideas do you have? Comment below!